Abstract. To characterize the stress field at the Grimsel Test Site (GTS) underground rock laboratory, a series of hydrofracturing and overcoring tests were performed. 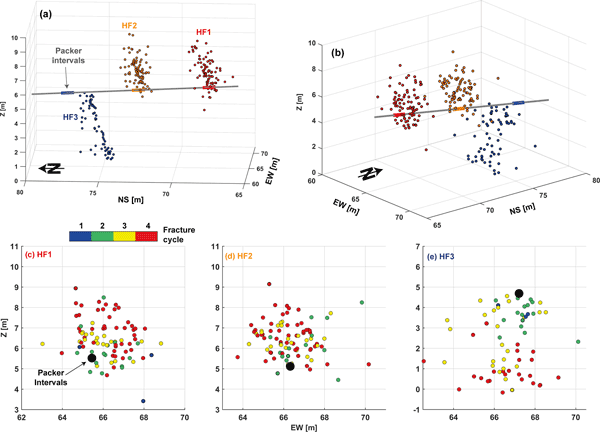 Hydrofracturing was accompanied by seismic monitoring using a network of highly sensitive piezosensors and accelerometers that were able to record small seismic events associated with metre-sized fractures. Due to potential discrepancies between the hydrofracture orientation and stress field estimates from overcoring, it was essential to obtain high-precision hypocentre locations that reliably illuminate fracture growth. Absolute locations were improved using a transverse isotropic P-wave velocity model and by applying joint hypocentre determination that allowed for the computation of station corrections. We further exploited the high degree of waveform similarity of events by applying cluster analysis and relative relocation. Resulting clouds of absolute and relative located seismicity showed a consistent east–west strike and 70° dip for all hydrofractures. The fracture growth direction from microseismicity is consistent with the principal stress orientations from the overcoring stress tests, provided that an anisotropic elastic model for the rock mass is used in the data inversions. The σ1 stress is significantly larger than the other two principal stresses and has a reasonably well-defined orientation that is subparallel to the fracture plane; σ2 and σ3 are almost equal in magnitude and thus lie on a circle defined by the standard errors of the solutions. The poles of the microseismicity planes also lie on this circle towards the north. Analysis of P-wave polarizations suggested double-couple focal mechanisms with both thrust and normal faulting mechanisms present, whereas strike-slip and thrust mechanisms would be expected from the overcoring-derived stress solution. The reasons for these discrepancies can be explained by pressure leak-off, but possibly may also involve stress field rotation around the propagating hydrofracture. 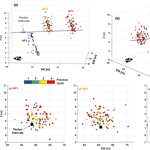 Our study demonstrates that microseismicity monitoring along with high-resolution event locations provides valuable information for interpreting stress characterization measurements. How to cite: Gischig, V. S., Doetsch, J., Maurer, H., Krietsch, H., Amann, F., Evans, K. F., Nejati, M., Jalali, M., Valley, B., Obermann, A. C., Wiemer, S., and Giardini, D.: On the link between stress field and small-scale hydraulic fracture growth in anisotropic rock derived from microseismicity, Solid Earth, 9, 39-61, https://doi.org/10.5194/se-9-39-2018, 2018.